Monday night, after dinner and writing the blog, we decided that watching the third period of the hockey game at home would be too boring so, instead, we went to the hospital and watched it there while they monitored Jen's blood pressure and the heart beats of the babies. Everything was fine and the doctors seemed very blasé about the whole thing. They assured us that if you have twins you just end up in the hospital three or four times before you give birth. That's just how it goes. So at 9:30 AM, after spending twelve hours at the hospital with no sleep and the echo of the babies kicking their fetal monitors ringing in our ears, we returned home and I went straight to work. I figured it was good practice for what it's going to be like in a few months when this is a daily occurrence. It turns out I need the practice because I'm quite bad at it. By the time I got home I had barely enough energy to boil some capellini so we could eat it before passing out. Jen has not enjoyed lettuce or salads lately. This is unfortunate given that the farm share usually opens up largely with lettuce and this year was no different. 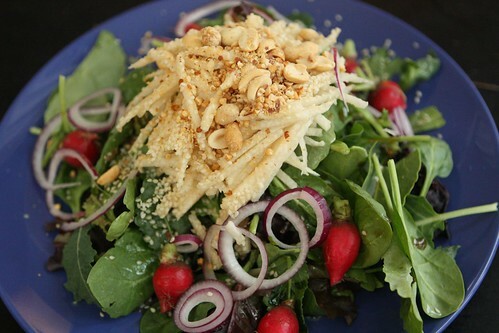 I threw together some baby greens and topped them with jicama, peanut, sesame seeds, red onion, radish, rice wine vinegar, lime, and sesame oil. Even given Jen's pregnant dislike for greens she completely finished her salad. With the bok choy and Chinese cabbage from the farm I chopped them up and sauteed them up with some fresh ginger, red pepper, local New Jersey shitake mushrooms (no really), rice vinegar, sesame oil, and chicken stock from the freezer. 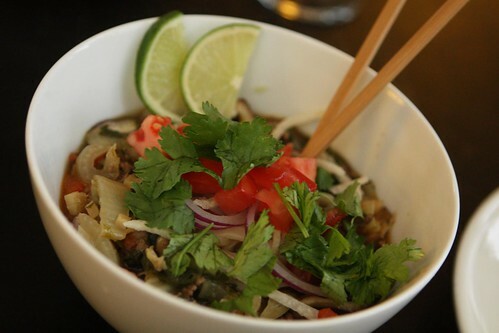 After it cooked down I tossed in the leftover beef mixture from the enchiladas the other night and served them up with some cooked udon noodles in a bowl with tomato, cilantro, lime slices, and fresh jicama. It was a good use of some of the greens but I'm going to have to get creative in the next few days to figure out how to use the rest. 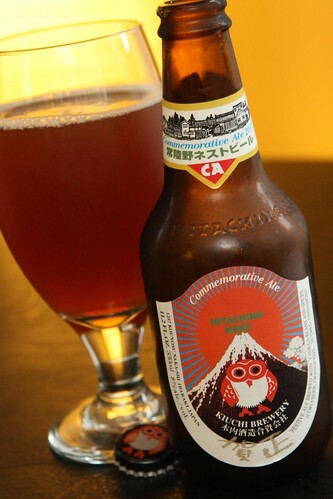 To keep things thematic I had this Hitachino Nest 2011 Commemorative Ale from Kiuchi Brewery in Japan. This was a very nice beer which I unintentionally aged in my beer cellar (read: cabinet) over the past 8-10 months. If you'd poured this beer and not told me what it was I would have guessed it was of Belgian origin which means I enjoyed it thoroughly. I was going to keep things thematic with dessert as well but instead I opted to try and clear out the freezer of random frozen treats while we watched Eureka and enjoyed a new found appreciation for the slowly dwindling nights where we'll be afforded a full night's sleep. Those little hell beasts can't take that away from us. At least not yet.